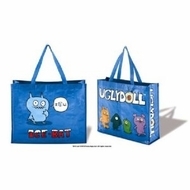 Carry your favorite UGLYS in style! Recyclable, they're perfectly green and sure to be seen! Comes in 4 really ugly colors; Blue, Red, Pink and Orange.